Nominated attractions include the John Deere Historic Site and John Deere’s original home, both located in Grand Detour, IL. John Deere has announced that it has been included on the “Top 200” lists commemorating Illinois’ 200th birthday. As the state celebrates its 200th year, it is creating “lists of 200” to honor some of the people, places, and inventions of Illinois. John Deere created his successful self-scouring steel plow in Grand Detour, Illinois, in 1837. His legacy still lives on in Illinois today, and he is recognized on some of the existing bicentennial celebration lists. Illinois residents have also voted to select the John Deere Historic Site in Grand Detour as a top historic site in the state. Earlier this year, residents chose John Deere’s steel plow as the top invention and innovation in state history. In addition to Illinois residents, the Illinois Council of The American Institute of Architects (AIA Illinois) recently named John Deere’s original home of Grand Detour to the list of “Great Places.” Nominations came from architects across the state. The home that John Deere originally built in Grand Detour is now a part of the John Deere Historic Site. It was designated a National Historic Landmark back in 1964, and placed on the National Register of Historic Places in 1966. Originally, the house only measured eighteen-by-twenty-four feet, with five rooms. 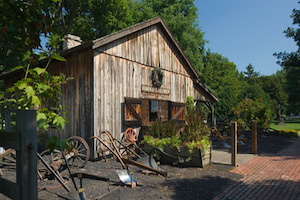 Today, visitors to the historic site can enjoy guided tours of the home, along with a recreation of Deere’s blacksmith shop, and an archaeological exhibit featuring Deere’s tools and artifacts. John Deere attractions are free and open year-round. To plan a visit to these top places, visit www.VisitJohnDeere.com for more information.